GOLETA, Calif. -- Thousands mourned the deaths of their classmates at a California university, lawmakers proposed ways to prevent the next round of deaths, and the rampant presence of guns were at the forefront of both discussions as a rampage that left seven dead reverberated across the state. Richard Martinez, whose son, Christopher Michaels-Martinez, 20, died in the attacks, spoke at Tuesday's memorial on the campus of the University of California, Santa Barbara, emphasizing that he did not speak for all the victims' relatives or even his former wife, Michaels-Martinez's mother. But he urged students to fight for tougher gun laws, and placed the blame on what he called the inaction of politicians. "They have done nothing, and that's why Chris died," Martinez said. "It's almost become a normal thing for us to accept this." He got much of the crowd to repeatedly chant "Not one more," in reference to such massacres, a phrase he shouted before reporters and television cameras the day after Friday's massacre. The school canceled classes and declared a day of mourning and reflection, four days after the shootings and stabbings in the Isla Vista community by 22-year-old community college student Elliot Rodger, who had posted an Internet video outlining his plan to slaughter as many people as possible. 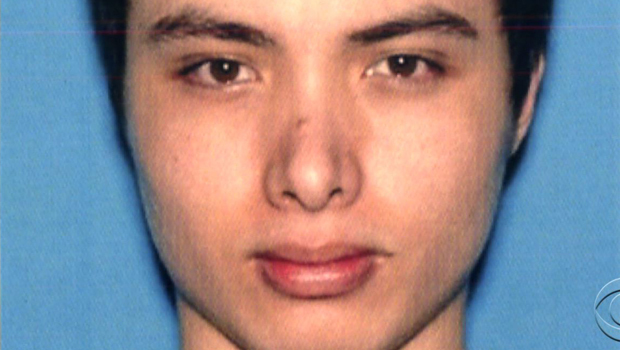 Police say Rodger, who was angry because women were not attracted to him, stabbed to death his three roommates, Weihan "David" Wang, 20; Cheng Yuan "James" Hong, 20; and George Chen, 19. Rodger then shot and killed 19-year-old Veronika Weiss, 22-year-old Katherine Cooper, and Christopher Michaels-Martinez, 20, in a rampage that left 13 other people injured. Rodger had legally obtained three semi-automatic handguns and still had 400 unspent rounds of ammunition when he shot himself to death, authorities said. The intersection of gun laws and mental illness has again been thrust in the national spotlight by Rodger's rampage. And in California on Tuesday, two Assembly members proposed legislation that would create a gun violence restraining order that could be sought from a judge by law enforcement at the request of family members and friends. "When someone is in crisis, the people closest to them are often the first to spot the warning signs, but almost nothing can now be done to get back their guns or prevent them from buying more," said Democratic Assemblywoman Nancy Skinner of Berkeley, who sponsored the measure with Das Williams, D-Santa Barbara. Another proposal involves establishing statewide protocols for law enforcement officers who are called to check on mentally troubled people. Senate President Pro Tem Darrell Steinberg, D-Sacramento, suggested that authorities should be required as part of such welfare visits to check whether a person has purchased weapons instead of just talking to the person. "There is a lot we can do to prevent these kinds of horrific events in the future," said Steinberg, who has spent much of his time in the Legislature addressing mental health concerns. State senators spent 35 minutes at the state Capitol eulogizing the students killed in the weekend violence and expressing frustration that such rampages continue despite previous efforts to end the problem. The rampage came hours after Rodger emailed a lengthy manifesto to his parents, therapists and others, and a month after sheriff's deputies had visited him on a welfare check after his parents became concerned about his postings on YouTube. At Tuesday's memorial, Martinez also read statements from the families of two other slain students, Cheng Yuan Hong and Weihan Wang, both 20, in which they asked for prayers or blessings for the families of the victims and the killer. "May we together create a peaceful world and let hatred be gone with the wind," the Hong family statement said. UC President Janet Napolitano paid tribute to the victims, saying "each of the victims left a mark on the world" and "as long as we hold them in our hearts, they are not gone." "All died much too young, but it's important that we do not let the arithmetic of this atrocity define them," she said. "I am deeply saddened and heart broken by the tragedy that has happened. We ask why such a beautiful place and why beautiful people have been hurt this way," Napolitano said. But she added, "We have a spirit and resilience in our community that can never be taken from us."